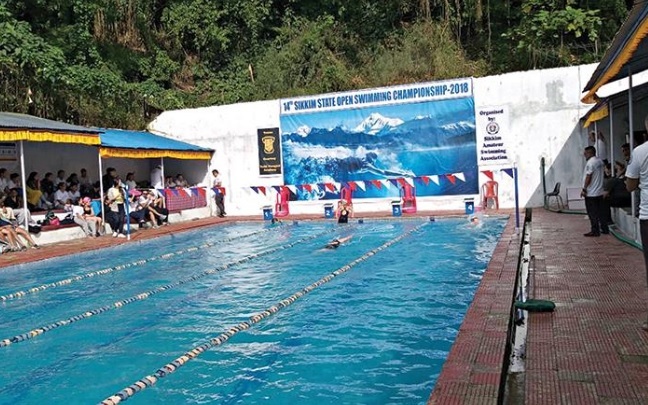 The 14th Sikkim State Open Swimming Competition kicked off at the Tashi Namgyal Academy (TNA) swimming complex in Gantok on Saturday. The competition was declared open by TNA director Maj Gen (Retd) Vinod Kumar Pillai. The two-day competition has 66 swimming events having participation of over 150 swimmers from different schools of the State and open participants. Notably, Sikkimese students studying outside the State are also taking part in the competition. The organizers said the main aim of organizing the competition is to build up a competitive spirit among the State swimmers and also to equip them for regional, national and international level competitions. Notably, four swimmers from the State have already participated in 2017 Khelo India swimming events. For the second half of the day’s event, the chief guest was Sports additional director Kamal Chettri. He informed that the Sports department under School Games Federation of India (SGFI) will soon be organizing swimming competitions at the state level. The competition is being organized by Sikkim Amateur Swimming Association (SASA). On the occasion, the SASA thanked State Chief Minister Pawan Chamling for announcing grants to A, B and C grades clubs and sports associations of Sikkim and five per cent government job reservation to the sportspersons. They also thanked the Sports Department for their help and guidance for the uplift of the sports sector in Sikkim. The judges for the competition were the members from SASA. The winners of each category will be awarded medals and certificates. The finale will be held in the second half of Day 2 that is on Sunday.